She will be 2 next week. This is from our trip to the arboretum. 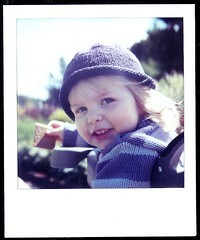 She was such a sport, just hanging out i the stroller, eating graham crackers and saying "Hi" to everyone. I think it is safe to say she has my eyes. September 14, 2006 by carol strand.